There is nothing more satisfying than opening your front door to find your online order at your doorstep. For the shopper, it takes one click. For the E-commerce vendor, it is a much different and longer story. As an E-commerce vendor in Australia, offering a fast, timely and affordable delivery is a tough challenge. Australia is one of the biggest yet least densely populated countries in the world. This makes it difficult to provide services such as same-day delivery or even next day delivery as Australia’s shipping infrastructure cannot handle these vast distances between population centres. However, it’s not all doom and gloom there are a lot of services in Australia looking to improve the way goods are shipped around the country and this guide will help you select a service that is right for you and your business. No matter what you sell. We have also included our five point set up guide to affordable shipping that will not eat into your profits. Australia has a large number of delivery companies moving E-commerce orders around the country. Some of these companies include Couriers Please, DHL, UPS and FedEx. But the biggest player of them all is Australia Post. Lets take a look at each delivery service in more detail. Australia Post is the most established delivery service in the country. Established 1809 Australia Post have been delivering parcels for over 200 years. Australia Post offers a vast array of delivery choices and options for letters and parcels of all sizes. They also provide business mail, customer communication solutions, domestic shipping and domestic parcel so you can send your goods around the country easily. They also have over 4400 post offices around the country, which makes parcel lodgement easy as well as customer pick up, particularly in regional centres. Australia Post also has a list of subsidiary services that cater to your business needs. 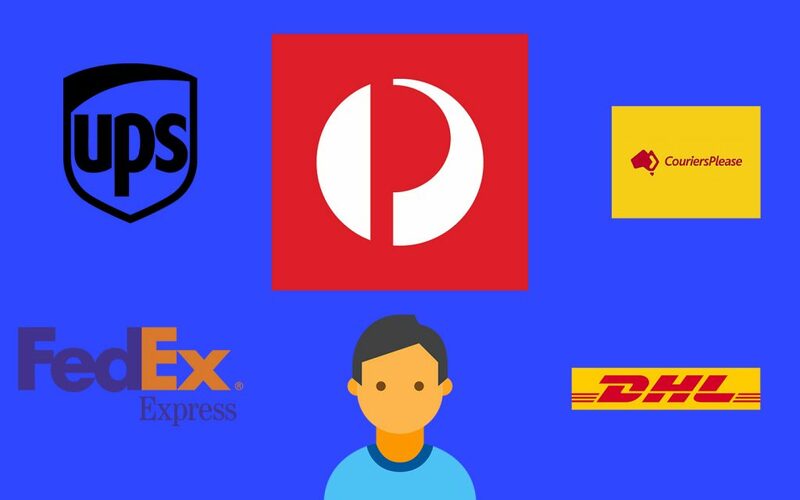 In this blog, we will cover the two most popular Australia Post subsidiaries E-parcel and Startrack. Shipping features such as tracking, pickup requests, rate quotes etc. If you plan to sell internationally its worth getting a DHL account. Couriers Please is a specialised metropolitan parcel delivery service that has grown into a leading parcel delivery expert with nationwide coverage across Australia. Although they are a courier service CouriersPlease have recently released two new services which are designed to help E-commerce vendors like yourself and your customers. The first is the POPStation (Pick Own Parcel Station) which allows customers to collect their parcels at their own convenience. The second is their partnership with HUBBED (a one-stop E-commerce aggregator) that connects to a network of newsagents to provide parcel delivery to every major city in Australia. Giving customers seamless access to their parcels. But what if you’re looking for something more then a just shipping service? What if you’re looking for a service that will automate your entire E-commerce delivery operation while you focus on growing your business? KeepSpace is an E-commerce order fulfilment centre based in Perth and Melbourne that takes care of the picking packing and shipping of all your goods giving you more time to focus on the stuff that matters for you and your business. To see if KeepSpace is right for your business, you can check out our pricing calculator here. This guide offers five points to consider when setting up your shipping method for your business. The last thing you want to do is upset your customer because your product was delivered in less than perfect condition. While you can’t control what happens after you send your product to the “courier” or ‘postal” service of choice you can invest in quality packaging to minimise the risk of a broken package arriving at your customer’s door step. If you’re stuck or not sure how to package your goods, sites such as Youtube provide heaps of free tutorials in this space. To select the right shipping method there are three things you have to consider cost, time and most importantly what the customer wants. As we said earlier in the blog post. Australia’s costs for shipping are considerably high especially if we compare them to the U.S. This is because of the logistical challenges and costs delivery companies incur when covering vast distances between locations in a timely manner. (The closest city to Perth with over 1 million people is Adelaide which is 28 hours away.) Despite the delivery challenges we face customers still expect high level of delivery service. Check out this blog to find out customers want regarding delivery options. Obviously, the best option for the customer is free shipping. (not so much for the vendor). In saying that, free shipping can be affordable for your business if it only applies to domestic customers. Otherwise, you run the risk of eating into your margins. But does free shipping correlate to more sales? Yes in some cases but there are no guarantees. so here are a few alternatives to consider. Increasing the price of your product to cover shipping fees has become a common industry practice for those dealing with products of high retail value, such as luxury or hand-made products. Offering a minimum order quantity to justify free shipping is also a good alternative if your prices are sensitive to price hikes. It is also a good way to boost sales on your site if you are clever with your marketing and how you offer “add on” products. This is another popular method. However, this method needs to be done correctly to be effective. For starters, make sure you are transparent with your customer. State what you are charging and why, if you are a small business that is socially motivated people will have no problem paying a little bit extra once they know they helping your business grow. This is why it is important to be honest about your business, many businesses look like they are one of the big fish online when in reality they are just starting out. However, one downside to this method is the varying shipping costs that charged to the customer. This makes budgeting difficult especially if you are not tracking your products margins carefully. This may seem like the easy option but it takes a lot of data and experience to work out what the average shipping value of your products is. Even when you actually do come up with a figure that works, there is also an element of risk involved (if you end up only selling the cheap products, your profits would take a serious hit). Flat rate shipping works best for business which have limited products with similar profit margins. That way, the risk of you eating into your margins is mitigated. In Australia, most goods and services are charged with a Goods and Services Tax (GST) of 10% when purchased. This tax also applies to all goods imported to Australia that has a value of over AUD$1000, plus other taxes that may be applicable according to the class of the goods. From July 1, 2018, 10% GST is due on all goods sold by foreign online retailers to Australian consumers. Once the non-resident e-merchant sales more than AUS$75,000 per annum, they must GST register with the Australian authorities, file and pay any tax due. It is estimated that over 3,000 foreign companies will have to register for GST on goods. For international deliveries, it is important to understand the tax regulations of overseas markets. This is why DHL is a popular choice for merchants that sell high value products overseas. DHL allow you to pay the customs duty prior to the shipment being sent out. Leaving your customer without a tax bill alongside their order. Even if you’re just starting out and have no orders coming through your site. The best thing you can do is set up a business account with your chosen delivery service provider/s. By creating a business account you will be awarded perks as you process more orders through their system. These perks include cheaper and faster delivery as well as some other customer loyalty benefits. Once you’ve gone through all the steps mentioned above, you should be ready to launch your E-commerce business. So give yourself a pat on the back because now comes the even more challenging task of getting orders. KeepSpace is an E-commerce order fulfilment company based in Perth, Western Australia. KeepSpace automates your E-commerce orders so you can focus your time on growing your E-commerce store and less time packing orders. Contact us today by calling 1800 818 971.